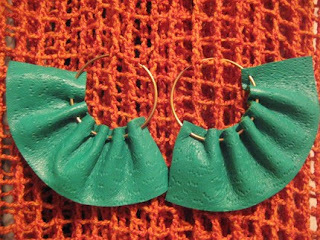 A fun pair of leather earrings from Melody's Addiction! I first started designing jewelry in high school. Then I took a long break while working in the non-profit and community organizing world. I hadn't made jewelry in years and then picked it up again about 6 years ago. Melody's Addiction emerged as a creative outlet and side-hustle about 5 years ago. Melody's Addiction really took a leap when I became one of the opening vendors for the, then brand new, Brooklyn Flea back in 2008. I've been a regular vendor with the Flea ever since and it's been a great space to connect face-to-face with customers and other designers. I gather random materials from various sources in New York and also from travels abroad. When I was working in the garment district I loved the leather stores, the fabric stores, the trim and lace stores....entire stores dedicated to buttons and buckles. One of my latest collections is inspired by Alexander McQueen’s Savage Beauty Exhibit that was at the Met this summer. Leather, feathers, fabric , lace fashioned into fun earrings! Love it all. My favorite part about designing and making jewelry is the whimsy and endless opportunity for invention. It's sole purpose is adornment and beauty. I live and work in Brooklyn and I am a regular vendor at the Brooklyn Flea in Fort Greene (though mostly during the outdoor season April-November). I do other markets occasionally like BUST Craftacular and Renegade Craft Fair. Year round you can visit me online at my Etsy Shop www.melodysaddiction.etsy.com and my Melody’s Addiction Facebook Page. (please join!!). Check in with my blog for upcoming sale dates at www.melodysaddiciton.com. I love the simplicity of the leather hoop earrings which come in many colors, some with funky cut-out shapes. They're big, bold, colorful and light weight! All the elements you want to make your entire outfit pop. Thanks, again, to Melody's Addiction for allowing us to share their work with you! Congratulations, Shakiera!